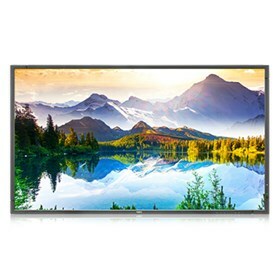 The NEC E905-AVT is a business-ready monitor that features a large 90" LED display with a 1920 x 1080 native resolution for viewing detailed Full HD images. This monitor's 280 cd/m² brightness rating and 5000:1 contrast ratio showcases its ability to handle light and dark on-screen images. The model also has 4ms response time, which helps it display fast-moving images with reduced image blur. Additionally, this monitor includes the NEC SB-03TM digital tuner module, which is installed in the E905-AVT's OPS interface. Internal 10W speakers and built-in handles enable a simplified installation. The E905-AVT is equipped with VGA, DVI, DisplayPort, and two HDMI ports for connecting a variety of video sources. In this model, IR and button lock options are provided for protecting against unnecessary setting changes. Integrated temperature sensors and thermodynamic cooling fans help to protect the panel from damage. The NEC E905-AVT has many exciting features for users of all types. See the NEC E905-AVT gallery images above for more product views. The NEC E905-AVT is sold as a Brand New Unopened Item.